Wednesday October 31, 2018: It's Halloween in Port Charles and Sam celebrates with Jason and his kids, Nina and Sasha spend time with Valentin and Charlotte, and Laura and Felicia’s fundraiser starts. At his penthouse, Jason helps Jake carve a pumpkin. Danny and Sam arrive. To Jason’s surprise, Danny is dressed as him. Sam tells the kids about when she surprised their father on Halloween. Danny wonders why he doesn’t know how to celebrate the holiday. He explains that he can’t remember it because of his head injury. Sam impresses them with her pumpkin carving. After the kids have their sugar crash, Jason puts Jake to bed. Danny tells Sam they helped his dad figure out Halloween. After he drops off, Jason thanks Sam for sticking around and helping. He admits it’s hard for him to know what to do. She assures him that it was special for the kids and tries to get him to eat candy. He laughs as she lists all the things she has dressed Danny as. Sam cuddles up to him and tells him how grateful she is he’s back. They kiss very slightly, and she says she should go. With some difficulty, she does. At the hospital, Franco is dressed as Willy Wonka and Liz is a cat. He takes Aiden off to the event he’s organized. Meanwhile, Ava, with costumed Avery in tow, bumps into Ryan. She’s sorry she missed their last meeting, so he offers to make another appointment with her. When she walks away, Laura shows up and accuses him of avoiding her. He insists he was just busy with a patient. She tells him she’s going to run a fundraiser at The Floating Rib with Felicia and invites him. 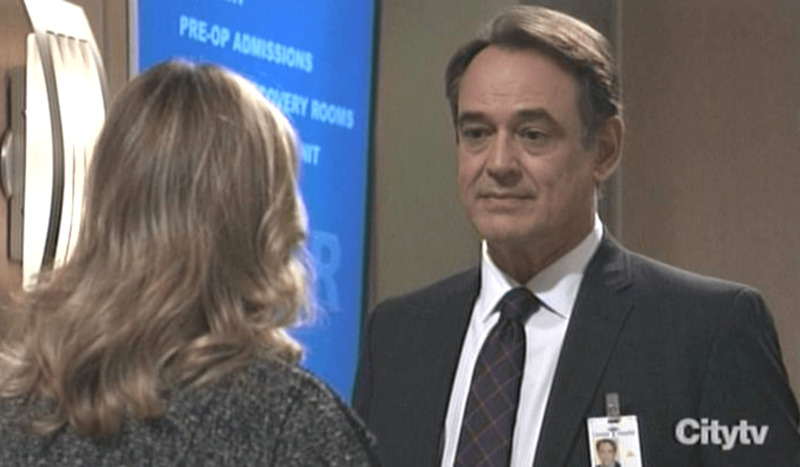 Down the hall, Griffin surprises Kiki at the nurses’ station and tells her he’s prepping with Monica to get re-instated. He invites her to the fundraiser. She has to work late and asks him to keep Sasha company at the Rib. As they kiss, Ava watches and Avery runs over to see Kiki. Ava sends the little girl off for candy and reminds Kiki to stay away from her sister. She lectures her for sleeping with Griffin and says she’s dead to her. Ryan watches and squints as Kiki tells her mom off and warns her that one day, she’ll have no one. Back down the hall, Laura and Liz talk about Aiden and his problems. Liz reminds her that she’s supposed to be at a fundraiser. After the nurse collects Aiden and Franco, they head home. In a Woodchuck’s uniform, Peter pops up at Maxie’s and surprises her with his costume skills. He wants to take her to the fundraiser but she thinks he’d have more fun without her. Flowers and balloons arrive from her parents. Peter realizes it’s her birthday and doesn’t think she should be alone. She insists she’ll be fine and sends him off. He soon returns with a birthday dinner and cake. After they eat, she looks for something to watch. She hates horror movies so they watch The Brady Bunch. After she blows out her candle, he tries to excuse himself, but she convinces him to stay. Valentin and Charlotte greet Nina and Sasha as they arrive at Wyndemere. Charlotte and Sasha discuss ponies and jobs while Valentin and Nina exchange glances. Sasha explains that she’s been ‘trying on’ being part of the family. Charlotte hopes they can all go riding together and asks Nina to put her to bed. Once Sasha has left and Nina has tucked Charlotte in, Nina asks Valentin not to remind her that they are still in love. She tells him the time they spent together was the happiest in her life, but they are divorced and that won’t change. She exits. There is a storm and she discovers the ferry has been shut down. She returns and accuses him of doing this. He promises that he didn’t. Ryan startles Felicia when he shows up at The Floating Rib. He helps with decorating and chats with her about the anniversary of Ryan’s crimes. She admits that leaving town only made her angrier. He’s bewildered as she goes on about how grandmotherhood is the greatest adventure. Ava drops in and makes an appointment with him. When she walks off, Felicia wonders how he can treat her. She lists Ava’s crimes and he reassures her. Sasha enters and joins Griffin at a table. Ava watches them as Sasha goes on about how much she doesn’t like dressing up. She tells him about her new family. When her hair gets snagged in her necklace, she asks him to help. Kiki walks in and sees this. Ava smirks. Ryan wanders over and she tells him she’s indulging in some ‘harmless mischief’. He guarantees that their time together will be ‘utterly rewarding’. He joins Laura and Felicia and tells them tonight will be unforgettable. Back at the table, Sasha tells Kiki she would love to stay with her and asks Griffin if he can handle them both. He toasts to that. Michael and Chase find something to bond over.